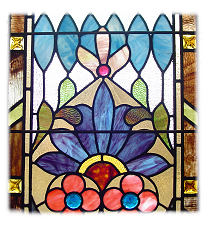 The stained glass windows of Centenary United Methodist Church are the crowning glory of the sanctuary to members and friends of the church. There is no single article of worship which bears the same significance to most of us as the Tiffany window "Light of the World," for this "Light" has been a beacon to us through times of joy, sorrow, tribulation and restoration. There are many factors to be considered in a project such as "Restoration: 1976 - 1977," but many of us feel that the presentation of our heritage was foremost in the hearts and minds of members of our congregation. It was the intent of Centenary's members to preserve and restore the sanctuary while retaining its beauty and worshipful atmosphere and to eliminate some of the features that reduced the sanctuary's usefulness. It was the intent of the building committee that this purpose be fulfilled, and to this end the building committee, members and friends have worked. This article tells something about five windows of the sanctuary - three new ones and two of the original ones. The reader will gain a fuller understanding of the meaning of the "Christian Symbols" if he refers to the pamphlet by this title furnished by the church and if he devotes some study to locating the symbols and symbolic use of colors. Within the nave one's eyes are immediately drawn to the magnificent Tiffany window on the north side. for all who enter to see. Christ is the only figure in this beautiful new window on the Madison Street entrance to Centenary. The new Reformation Window on the east side of the Franklin Street narthex highlights three reformers of the Protestant Reformation in the 16th century. The new west window in the narthex tells the "Methodist Story". ©Copyright 2019 Centenary United Methodist Church. All rights reserved.